1 HCFC Phase –out in Air Conditioning Sector Background, Challenges and Progress Sidi Menad SI AHMED 17 TH October 2012. 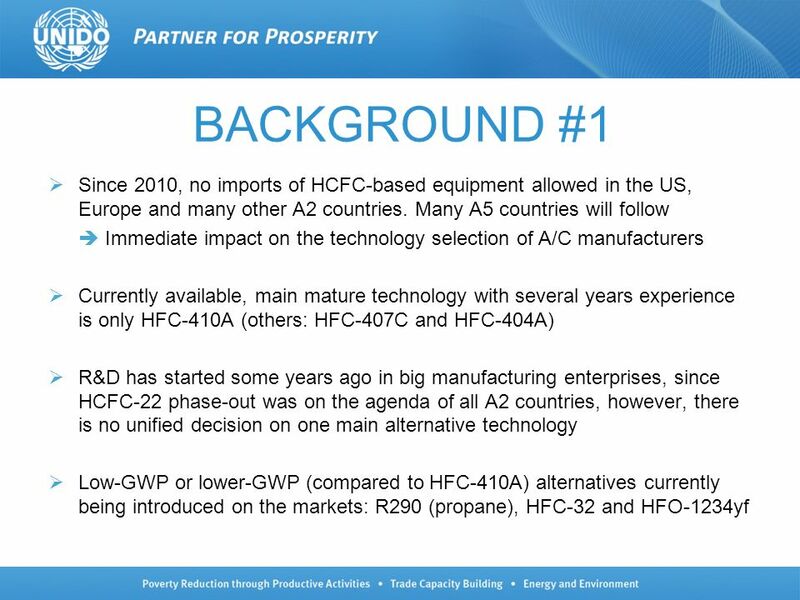 3 BACKGROUND #2 HFC phase-down has been on the table since some years, and Europe and Australia have already taken effective measures towards their limitation on those countries, thus replacement of HFC-410A will also happen in the medium future. 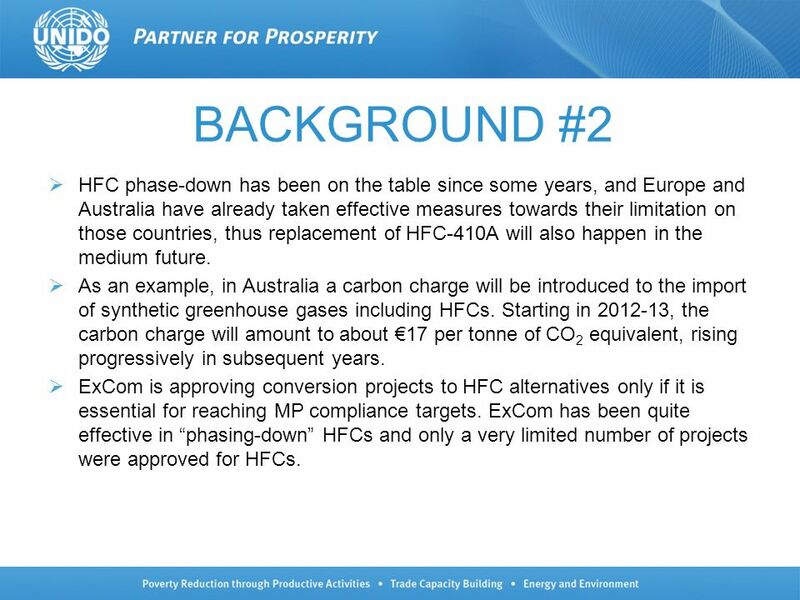 As an example, in Australia a carbon charge will be introduced to the import of synthetic greenhouse gases including HFCs. Starting in 2012-13, the carbon charge will amount to about 17 per tonne of CO 2 equivalent, rising progressively in subsequent years. ExCom is approving conversion projects to HFC alternatives only if it is essential for reaching MP compliance targets. 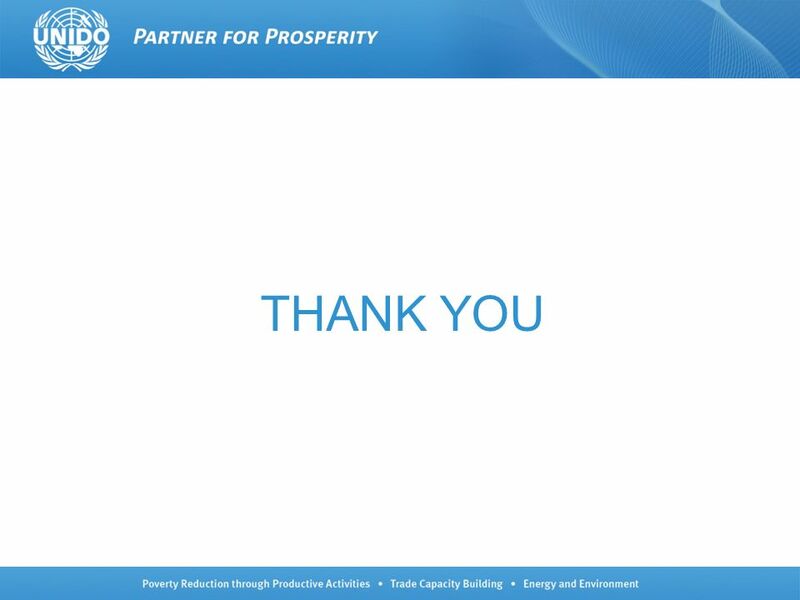 ExCom has been quite effective in phasing-down HFCs and only a very limited number of projects were approved for HFCs. 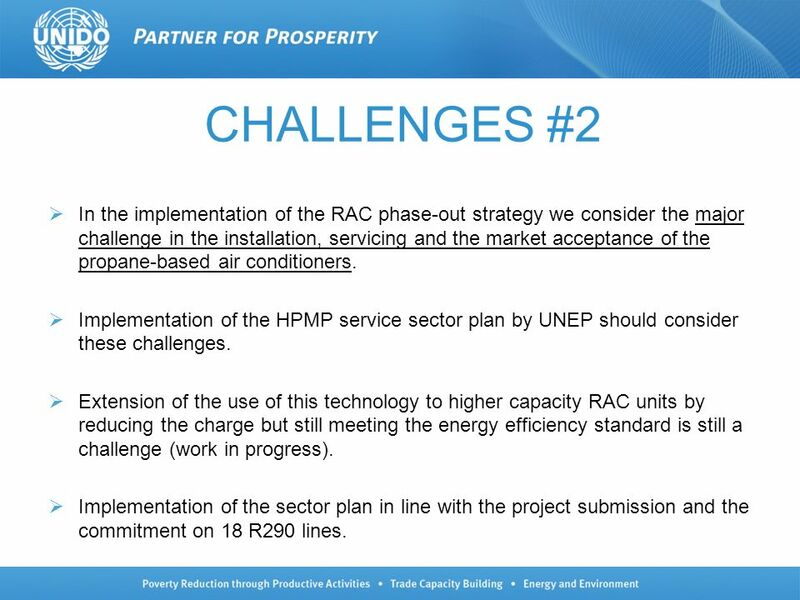 5 CHALLENGES #2 In the implementation of the RAC phase-out strategy we consider the major challenge in the installation, servicing and the market acceptance of the propane-based air conditioners. Implementation of the HPMP service sector plan by UNEP should consider these challenges. Extension of the use of this technology to higher capacity RAC units by reducing the charge but still meeting the energy efficiency standard is still a challenge (work in progress). Implementation of the sector plan in line with the project submission and the commitment on 18 R290 lines. 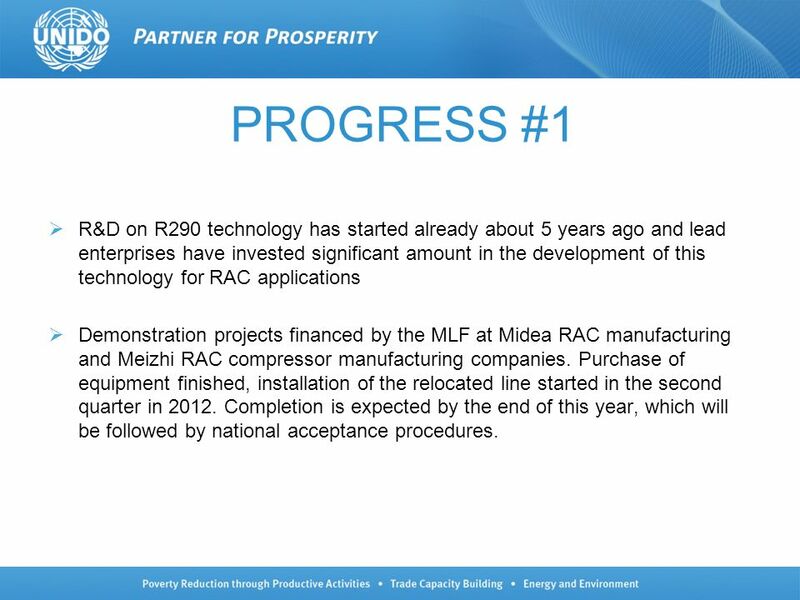 6 PROGRESS #1 R&D on R290 technology has started already about 5 years ago and lead enterprises have invested significant amount in the development of this technology for RAC applications Demonstration projects financed by the MLF at Midea RAC manufacturing and Meizhi RAC compressor manufacturing companies. Purchase of equipment finished, installation of the relocated line started in the second quarter in 2012. Completion is expected by the end of this year, which will be followed by national acceptance procedures. 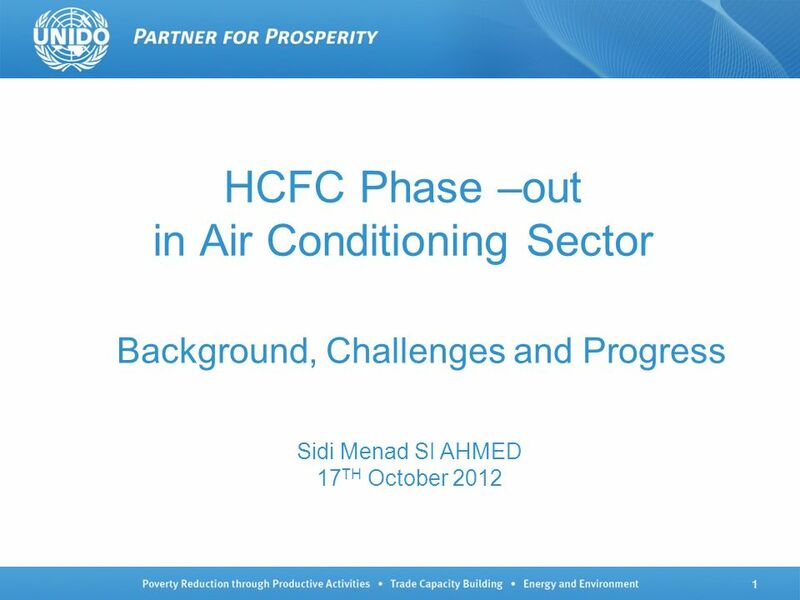 Download ppt "1 HCFC Phase –out in Air Conditioning Sector Background, Challenges and Progress Sidi Menad SI AHMED 17 TH October 2012." 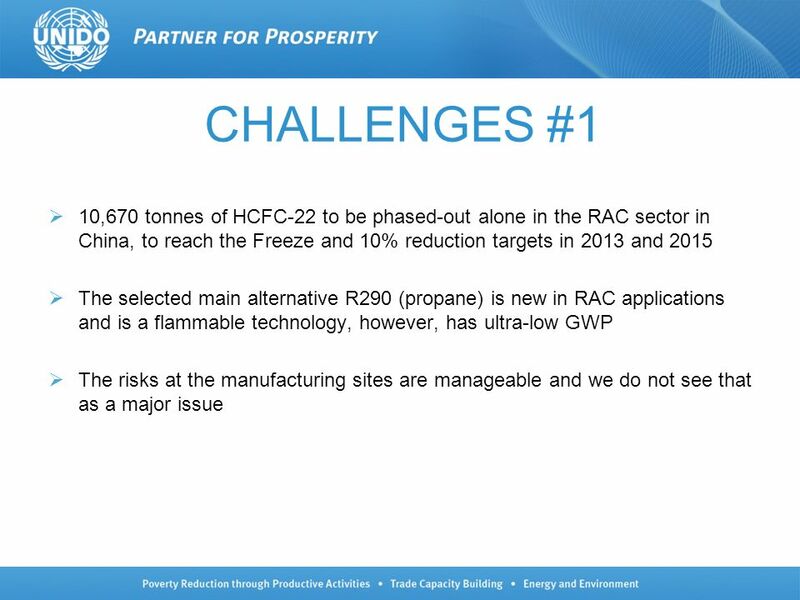 UNEP OzonAction Webinar on Challenges for the phase-out of HCFC in the air conditioner sector 17 th October 2012 Sukumar Devotta Member, RTOC and World. 1 Hydrocarbons as Alternatives to HCFC-22 A Cool Solution? UNIDO, Ole Reinholdt Nielsen 10 April 2013. 1 Mobilizing Available Funds To Destroy Ozone Depleting Substances. Workshop on ODS Bank Management (OEWG-30) Geneva, Switzerland Monday 14 June 2010 Timing, Size and Cost of ODS Bank Management Opportunities Paul Ashford. HFCs: A Critical Link in Protecting Climate and the Ozone Layer Alternatives to high-GWP HFCs UNEP side-event, Montreal Protocol MoP-23, 21 November 2011. M o n t r e a l P r o t o c o l, O E W G - 3 0, G e n e v a, J u n e XIX/8 Report on HCFC Alternatives for High Ambient Temperature. Work and Activities of the Executive Committee Relating to the Establishment of a Special Funding Facility to Support ODS Destruction and the Achievement. EPP Public Hearing Wednesday 12, January 2011 Last revised Pascal Faidy. 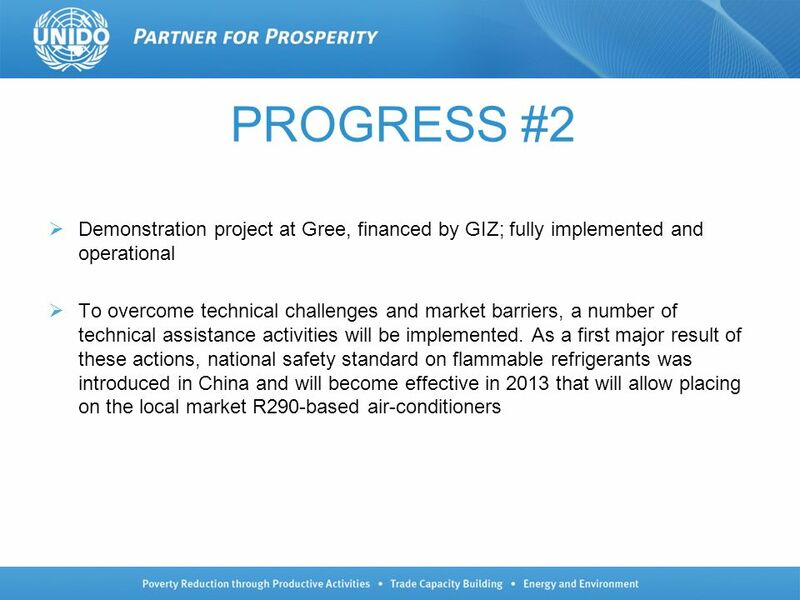 R290 Air Conditioner Presented on behalf of GREE By Dr. Volkmar Hasse, GTZ-PROKLIMA INTERNATIONAL At the Joint West Asia and South Asia Network Meeting. The Business Case for Avoiding & Replacing High-Global Warming Potential HFC Refrigerants While Phasing Out HCFC Refrigerants Arunabha Ghosh, CEEW Stephen. Private companies and the UNIDO/GEF Project for HCFC phase out in the Russian Federation. Joint SA-SEAP Ozone Officers Network Meeting Pattaya, Thailand October 2012 CHALLENGES FOR HCFC PHASE-OUT IN AIR CONDITIONING. Updates on alternative technologies and international developments in the Refrigeration and Air Conditioning Sectors. The Future of Refrigerants: Where Do We Go From Here? United Nations Development Programme Elements of HCFC Phase-out Management Plan Sri Lanka HPMP Inception workshop 31 March 2011. Seite 1 GTZ PROKLIMA INTERNATIONAL PROKLIMA The potential for hydrocarbon refrigerants as HCFC-22 replacement in air conditioning Atmosphere. 1 The Coca-Cola Company Confidential The Coca-Cola Company Sustainable Refrigeration For Commercial Applications Antoine Azar October 19th, 2009. Developments on the Phase- in of Low GWP Chemicals In Various Polyurethane Sectors Kultida Charoensawad PolyUrethanes Industry Group, Thailand UNEP workshop.